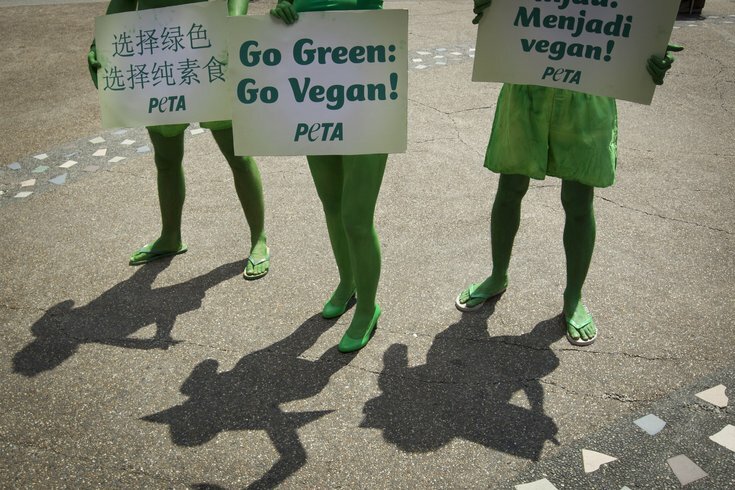 Members of People for the Ethical Treatment of Animals (PETA) hold placards to urge people to switch to a vegetarian diet. It's well-known that vegetarian diets are often healthier and have a smaller carbon footprint than omnivorous diets. Still, no matter how many pretty green girls PETA puts on parade, it's hard to believe that much of the world could be persuaded to adopt a vegetarian or vegan lifestyle. Research from Britain, however, has found that the whole world doesn't have to swear off meat entirely for there to be positive effects. Reducing meat consumption to no more than what's recommended by nutritional guidelines would still have a huge impact on both public health and the health of the planet. If everyone on the planet followed standard dietary recommendations for more veggies and less red meat, researchers estimate that 5.1 million fewer people would die by 2050 and food-related carbon emissions would go down 29 percent. Those are the estimates from an Oxford University study published online Monday in the Proceedings of the National Academy of Sciences. It's the first study to calculate the economic benefits of a worldwide switch to a more plant-based diet both in terms of healthcare savings and the impact on climate change. The scientists based their estimates on the assumption that a plant-based diet would both reduce greenhouse gas emissions and reduce the number of people with obesity, heart disease, stroke, diabetes and cancer. More than one-fourth of today's carbon emissions come from the food system, and 80 percent of those emissions come specifically from animals. If everyone followed nutritional guidelines (less red meat, more veggies): By 2050, there would be a 6 percent decrease in the global mortality rate, a 29 percent decrease in food-related greenhouse gas emissions and savings of $735 billion per year. If everyone became a vegetarian: There would be a nine percent decrease in mortality, a 63 percent decrease in food-related emissions and savings of $973 billion per year. If everyone became a vegan: There would be a 10 percent decrease in mortality, a 70 percent decrease in plant-based emissions and savings of $1.067 trillion per year. Of course, changing the world's diet would be an enormous challenge. Consumption of fruits and vegetables would have to increase 25 percent worldwide by 2050 and red meat consumption would have to drop by 56 percent. Humans would have to reduce the world's total calorie consumption by 15 percent. "The size of the projected benefits, even taking into account all of the caveats about the unavoidable sources of uncertainty in our work, should encourage researchers and policy-makers to act to improve consumption patterns. But we also show the magnitude of the task," the study authors wrote. For people in South Asia and Sub-Saharan Africa, the focus would need to be on increasing access to fresh produce. People in Sub-Saharan Africa, for example, would need to increase their fruit and vegetable intake by 190 percent to meet nutritional standards. In other regions of the world, the focus would be on reducing red meat consumption. High-income Western countries would need to eat 78 percent less red meat to meet dietary guidelines. Researchers did not write about how humanity would actually achieve these changes. They also warn that global climate change cannot be averted by changes to diet alone. Nevertheless, their work shows that a change in diet brings a double bonus both for your body and everybody in the world.